A jaunty stripe that'll get you noticed. 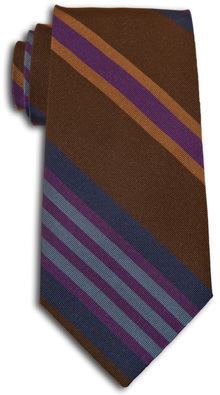 Gets its name from the part of the tie where there are 4 stripes surrounding 3 stripes. But it could have been called numerous things (234 Stripe say), all admittedly somewhat arbitrary. Mogador fabric (which is silk with some cotton woven in -- gives it a unique look and feel). Made by hand.